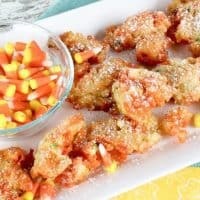 Funfetti Fried Candy Corn is an over-the-top delicious recipe perfect for Halloween or for using up leftover Halloween candy. While there are many healthy treats to enjoy during the month of October, we all know what everyone really wants. Everyone wants the sugar-spiked goodness. And, what’s more sugar-spiked than candy corn? 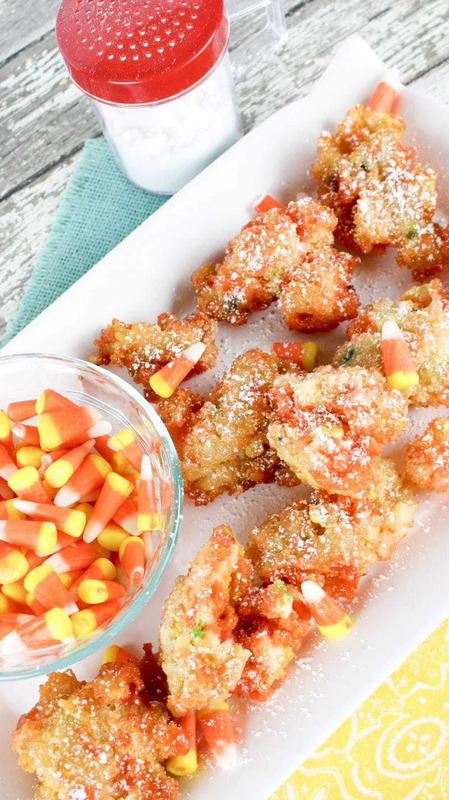 That’s right — it’s Funfetti Fried Candy Corn! This is the type of indulging fried treat you would expect the county fair to have during the month of October. 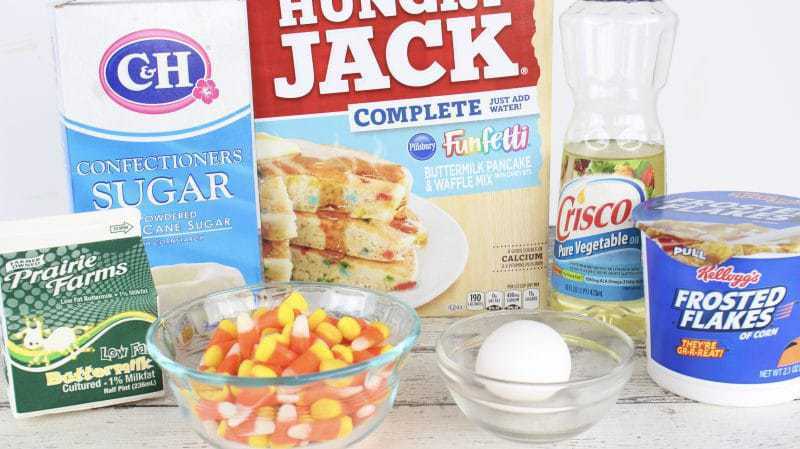 It’s fun, over-the-top, and sure to be a favorite for anyone that loves candy corn. This is such a fun recipe. Not only is it unique and delicious, but it’s so easy to make. The recipe starts with pancake mix, which allows you to skip a lot of the measuring and mixing. 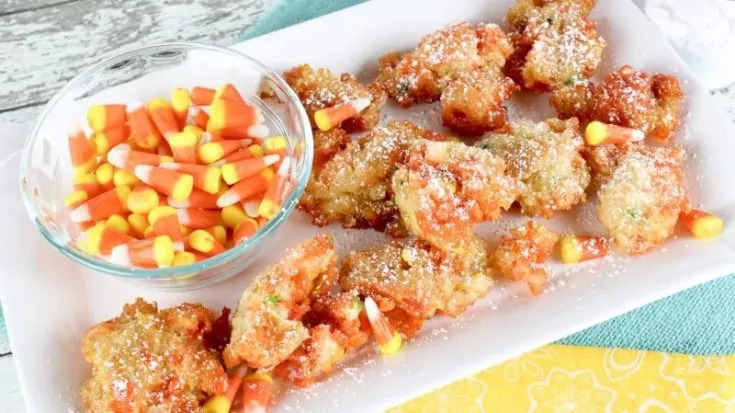 The cornflakes give the Fried Candy Corn a nice crunch that you’re going to love and since they’re frosted, you’ll enjoy even more delicious sugar. Let’s be honest. This is a recipe that your kids are going to go bananas for. But remember, it is literally PACKED with sugar. If you’re hoping for an early night, you may want to save this recipe for another time. 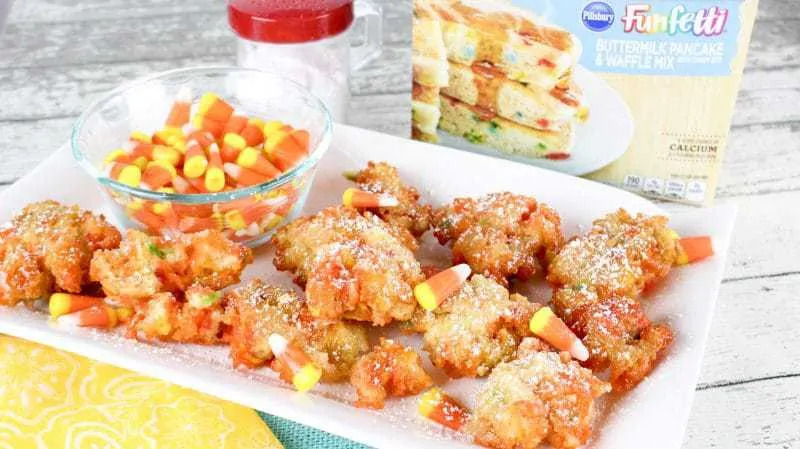 Maybe used that candy corn to make a batch of edible candy corn slime with the kids instead. Cuz what kiddo doesn't love slime?! Of course, no one said you had to include the kids on the fun. You and your spouse could enjoy these all alone as your own special treat along with a glass of Black Widow Venom Moonshine, or bring them to a Halloween party. Let’s take a look at what you will need to make this recipe, and then I will go through the process with you step by step. You can find a printable version of the recipe at the bottom of the post included for your convenience. 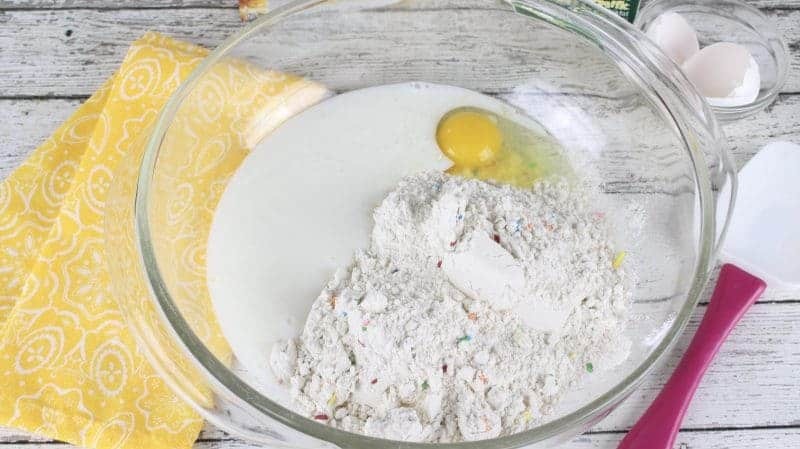 In a large bowl, add funfetti pancake mix, egg, and buttermilk. Stir well. 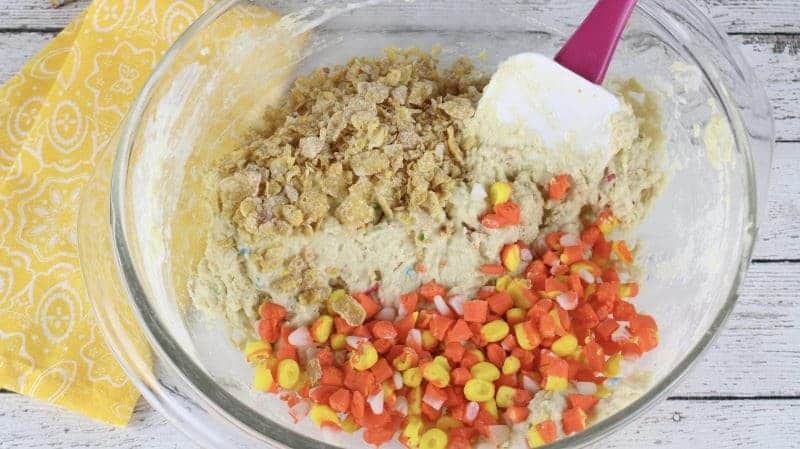 Then, add the chopped candy corn and cereal. Stir well to incorporate. Next, add 1 1/2 inches of oil to a frying pan or Dutch oven and heat over medium heat for 5 minutes (or use a candy thermometer to reach 350°). 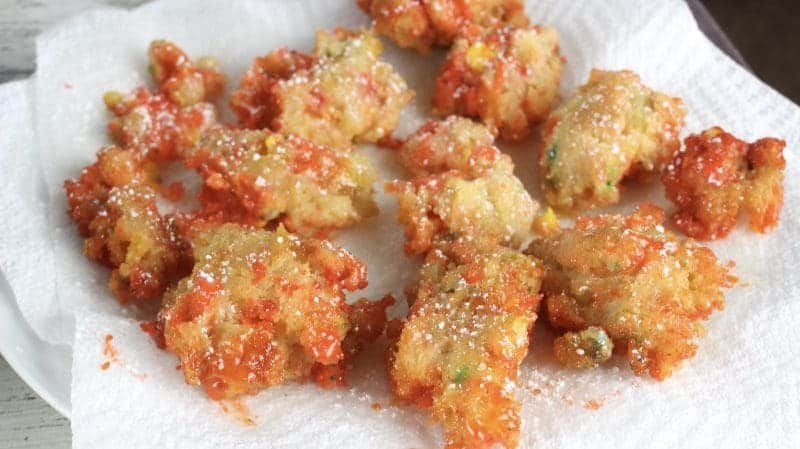 Drop the candy corn dough by Tablespoons into the hot oil. Fry on both sides for 1 minute each. Place on a paper towel for 1-2 minutes to soak up any excess oil and sprinkle with powdered sugar. Transfer to a wire rack to completely cool. (Do not wait any longer than 2 minutes to transfer or the fried candy corn dough will begin to stick to the paper towel). 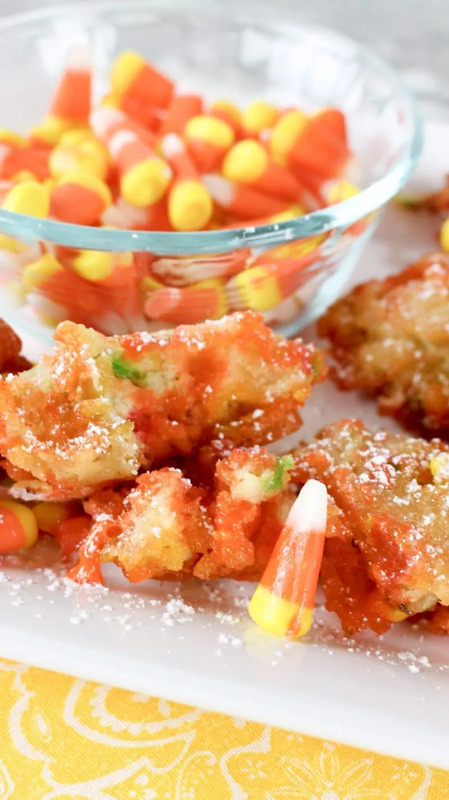 I hope you enjoyed this Funfetti Fried Candy Corn recipe and that you and your family have a fantastic Halloween. 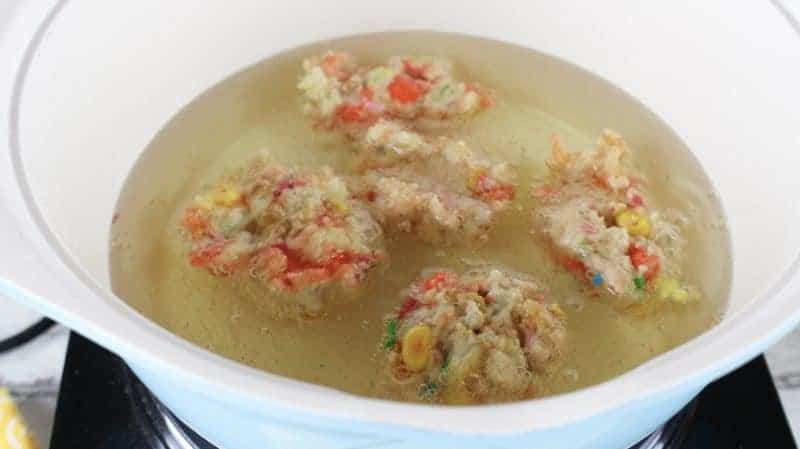 If you are looking for more Halloween treats check out these run recipes: Frankenstein Jolly Rancher Suckers, Dirt Cup Brownie Bites , Spiderweb Cupcakes and Mummy Rice Krispie Treats! In a large bowl, add the pancake mix, egg, and buttermilk. Stir well. Add the chopped candy corn and cereal. Stir well to incorporate. Add 1 1/2 inches of oil to a frying pan or Dutch oven and heat over medium heat for 5 minutes (or use a candy thermometer to reach 350°). 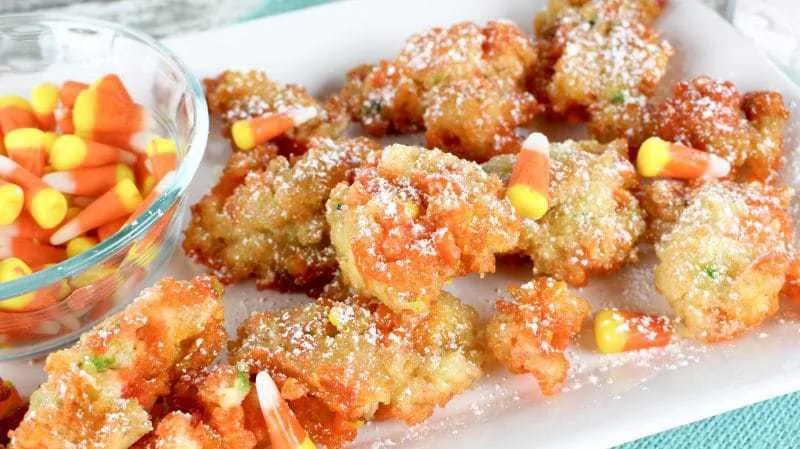 Drop the candy corn dough by Tablespoons into the hot oil. Fry on both sides for 1 minute each. WHOA! 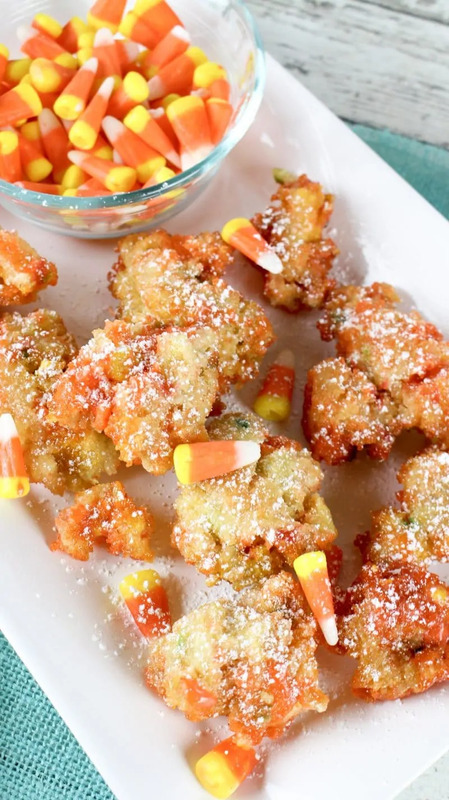 These look incredible for those of us who cant wait to eat candy corn each fall! I love Candy Corns!! What a fun treat to make for the fall season!! I know my kids would be all over this! Wow you’re right that is a lot of sugar but I bet they taste great! The bonus is because they are so sweet you don’t have to make tons of them because people wouldn’t be able to gorge on them. Very creative! I’ve never seen anything like this before but it sounds delicious! I’m a candy corn fan so I’ll be giving it a try.